The Abode of Yoga: Happy Birthday Mom! Dear Mama, by Tupac Shakur. If I have any good qualities today, then they are attributable to my spiritual life. My mom alone made that life possible for me. Without her, I am nothing. Mom supported my every interest. As a pre-teen, I was obsessed with track and field. My sole desire was to be an Olympic sprinter. For two or three years running, mom took me to the San Jose Relays, which became the Bruce Jenner Classic track and field meet. I doubt she knew much about track and field at the time, but she knew that I loved it and that was enough for her. I cherish the memories of those Saturdays still -- just mom and me: and Houston McTear, Renaldo "Skeets" Nehemiah, Mary Decker, Steve Scott et al. Mom introduced me to the liberal arts and gave me a liberal mind. An actress herself, she took me to community theaters and ACT in San Francisco. We saw plays, ballet, and poetry readings by Robert Bly, among others. She took me and Charlie, at our request, to the U.C. Berkeley Jazz Festival to see our musical heroes: Carlos Santana, John McLaughlin, Herbie Hancock, Stanley Clarke, and others. She looked out for my long-term interests, too. When mom had to make the personally difficult decision to send me to live with my dad when I grew out of control, she did so. And while I'm sure it broke her heart to do so, I'm a better man for her sacrifice. Mom gave me my first copy of Autobiography of a Yogi. When I'd finished it, she consoled me -- a 13 year old -- as I cried, thinking I'd already blown my chance at a spiritual life. She introduced me to Prahlad. 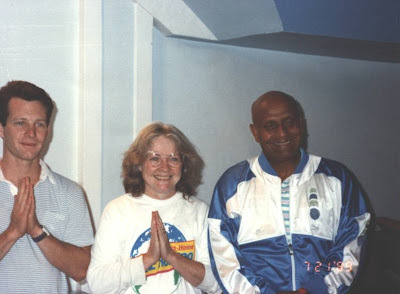 She signed the note that Sri Chinmoy required of me -- then a 16 year old -- to join the Center. Throughout my life, I've always been able to depend on my mom to support me in my various endeavors. She -- and she alone -- made it possible for me to embark on my spiritual journey. If I have any good qualities at all, then they are directly attributable to my beloved mom. The photo at the top shows me and my mom with Guru in late July 1989, just before the end of the Peace Run. 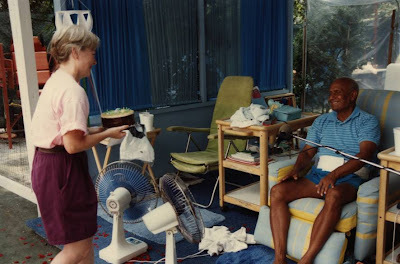 Once back in New York, Guru gave my mom a birthday cake (August 22) at the tennis court.